Patrick Henry was born 28 March 1835 in Henrysville Alabama to Hugh Jr. and Ann Claunch Henry. Ann was ¼ Cherokee Indian. 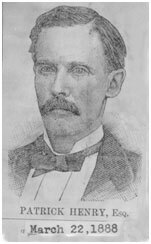 Patrick’s father Hugh Jr. was born 1796 in Henry’s Crossroad, Sevier County, Tennessee to Major Hugh and Mary Long- Henry. Major Hugh Henry served in the Battle of Kings Mountain during the revolutionary War. Hugh Henry Jr. and his son, Albert G. Henry of Tennessee were the first white merchants at Gunter’s Landing. The Henrys came to Gunter’s Landing in 1829 and started the first real mercantile business in what later became Marshall County. Needless to say, the majority of their customers were Indians for many years. Hugh’s second wife, Martha (Patsy) Gunter was a Cherokee Indian half-breed daughter of John Gunter (Guntersville AL is named for John). Martha is a sister of Will Rogers Great Grandmother. 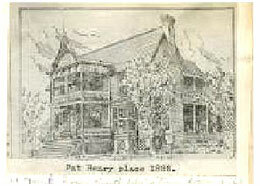 John Gunter’s will stated that Patsy was not to receive any inheritance as long as she was married to Hugh Henry. Hugh married Ann Claunch, a ¼ Indian about 1833 to this marriage were born Patrick and Thomas Benton Henry. On April 23, 1864, during the United States Civil War, at the age of 27, Thomas Benton Henry was killed. The family of Thomas recalled that he was sick and in bed when Union sympathizers came, took him outside and either shot or hanged him in front of his wife Elizabeth. Ann was first married to Dempsy Fields. To this union was born a daughter Mary Catherine. Dempsy died 10 July 1831. Patrick stated on his Indian application that his grandmother on his mother’s was Diana Campbell. Patrick was reared on his father’s farm; received a common school education; and took a two years course at Cumberland University, Lebanon, TN. He entered his father’s mercantile establishment at Henryville, in a clerical position, and at his father’s death he was given an interest in the business with his younger brother, Thomas Benton. Quoted from Blunt county Confederate (Volume 3) – 194 “ Henry. Patrick, Henry. Microfilmed Confederate Service Records Reported Henry enlisted in Captain Gilbreath’s Company E (Marshall County) of the 49th Alabama Infantry at the age of 26 at Guntersville on 2 Jan. 1862, appointed Captain of the Commissary on 8 May 1862 and also associated with the 31st Alabama Infantry, captured at port Hudson, Louisiana on 9 Jul 1863; sent North on the steamer Planet on 16 Jul 1863; imprisoned at Johnson”s Island, Ohio, forwarded to Point Lookout, Maryland for exchange on 21 Mar 1865 sent to Fort Delaware 28 Apr 1865, Patrick Henry’s home in Alabama in 1888 took the oath of allegiance at Fort Delaware and was released 12 Jun 1865, described as five feet 10 inches tall, light complexion, light hair, hazel eyes, residence: Marshall County”. Patrick and children, Gibbs, Albert, Marie and Patrick Jr. received Cherokee citizenship 30 September 1887, according to a certificate of admission, dated 30 September 1877. He stated on the application for the Dawes roll that he came to the Cherokee nation in 1888. Quoted from the Cherokee Advocate book three, page 170 dated 8 September 1882. “Since our last issue Prof. J. L. Smith and family, accompanied by Mr. Patrick Henry all of Guntersville, Alabama, have come and for the present are with relatives in Tahlequah. Mrs. Smith’s father was the late Dempsey, not Rider Fields as stated in the last week’s Advocate. Mr. Henry, her half-brother is a son of the late Hugh Henry, who for many years was a leading merchant in North Alabama. After the death of Dempsey Fields, the widow Mrs. Annie Claunch Fields married the young merchant Hugh Henry, who had lost his wife. To this union Mr. Patrick Henry readily traces his Cherokee blood—which, as in the case of his sister Mrs. Mary Fields Smith , will insure for him a place with us as a citizen of the Cherokee Nation provided he locates permanently with us. Mr. Henry and his sister Mrs. Smith were before our “Commission on Citizenship” Tuesday last, and furnished conclusive evidence of their Cherokee descent and purpose to become a part of us.” Patrick must have returned back to Alabama to dispose of his business, before returning in to the Cherokee nation in 1886. Quoted from an Editorial on J. 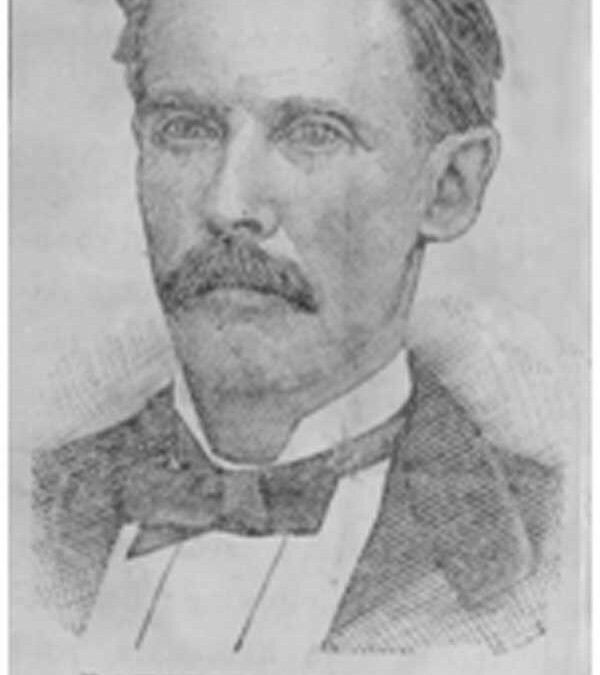 B. Mayes in the Cherokee Capital dated July 1888 Vol. 1 No. 6. Patrick Henry is listed among the prominent Chelsea citizens who gave their time and money to care for the unfortunate people who lost their homes and all their possessions in the tornado that destroyed the town of David located a mile south of Chelsea on 2 June 1898. At least one son Wallace Gibbs Henry stayed in Chelsea, he married Myrtle Barnes. To this union were born Dewitt Clinton. Roy W. and Myra Henry. Dewitt lived in Chelsea, he married Lou Lindley. 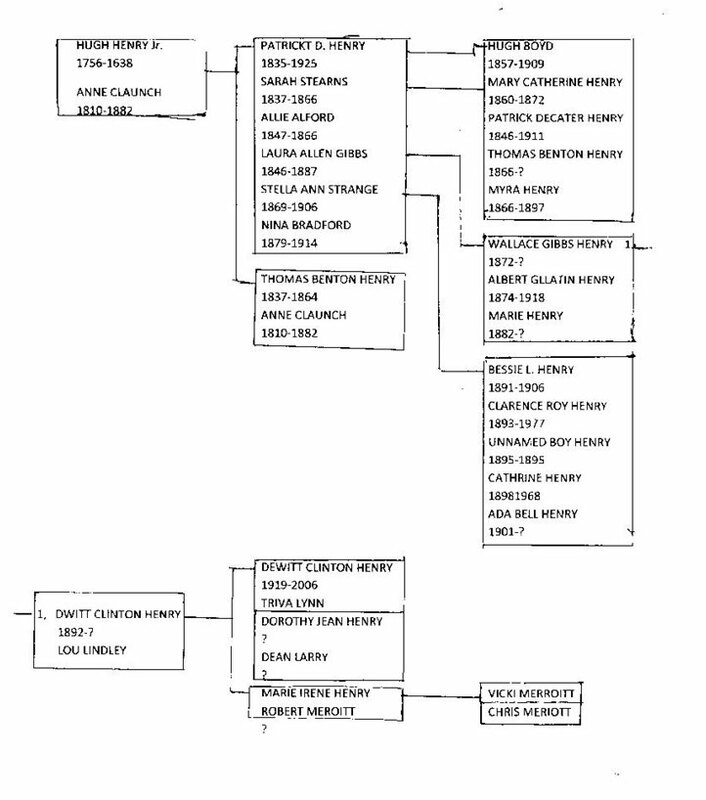 Born to this union were Dewitt Clinton JR., Dorothy Jean, and Mary Irene. Dewitt and Lou were a part of the Chelsea’s first graduation class from the 12th class in 1911. All the children graduated from Chelsea High School. Dewitt started working at the Bank of Chelsea (The first Bank in Cherokee nation established in 1896) as a book keeper later becoming Ex-vice president. Their daughter Mary Irene married Robert Lee Merriott, a Rancher and a partner in Harrell and Merriott Motor Company. Patrick moved to San Antonio Texas after 1900, he is listed on the 1900 census as living in Chelsea, Cherokee Nation, and in San Antonio on 7 Aug 1906 where Stella died in San Antonio Texas. Patrick died 17 September 1925 in San Diego California. “Give me liberty or give me death!”. “Bushyhead was just a wide place I the road, nothing there but a section house and a train switch. There was no Tulsa then. Claremore was very small, just a few shacks; about four stores, one of being F. A. Nielson’s store and a post office. “A true story about Panthers. but when the panther saw him move for the gun, he tore out of all the screaming a person ever heard. In my fancy I can still hear that awful crying. The animal ran and got on our shed and disturbed us most of the night, just kept on screaming.